A Shropshire store is expanding its product range by forging links with local craftspeople, national and international brands. 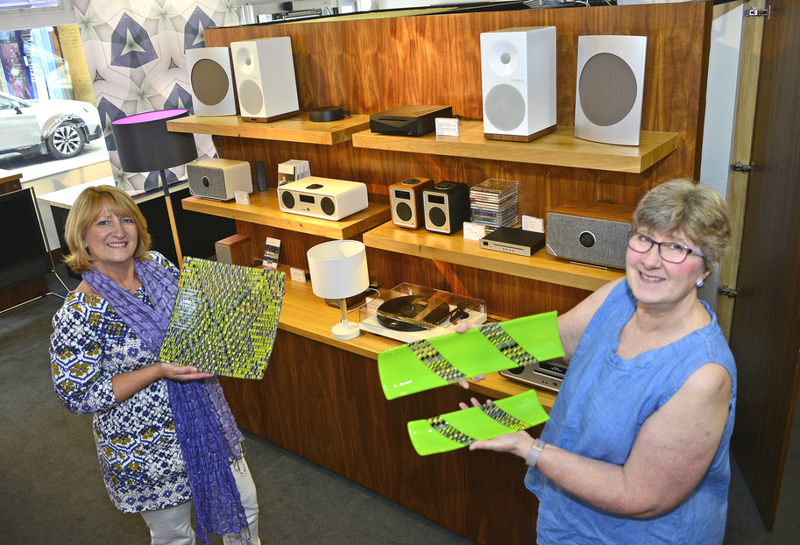 Acoustic Boutique, television and audio retailer based in Shrewsbury’s High Street, is aiming to showcase a selection of talented county artists and furniture makers. “We are developing a larger selection of home furnishings and accessories to complement our core audio visual products,” explained Tina Boyle of Acoustic Boutique. Jill Bagnall, who runs Fusing Ideas Glass, has become the first to partner with the store. Her business, based in Worthen, near Shrewsbury, produces colourful glass ware and art. “I am really pleased that my glass has been chosen to be stocked in Acoustic Boutique – it will give it a much wider audience,” she said. Tina Boyle added that she was talking to other local specialists about showcasing their work and a partnership had also been formed with international designer furniture brand MADE.com. “This means we can stock their lighting and have also added to our range of bespoke television cabinets from German company, Spectral, with a selection of off-the-shelf stylish wooden cabinets. “In addition we also showcase Ligne Rosset sofas and furniture, so we are expanding our offering to include quality products to enhance a customer’s home,” she said.